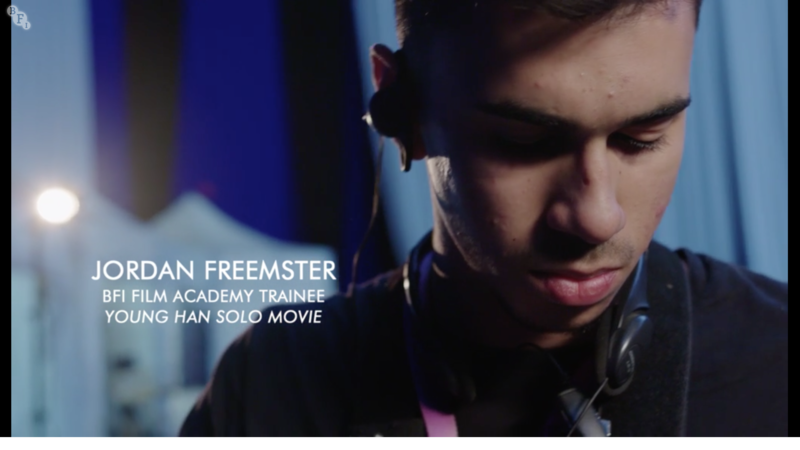 Just two years since graduating from the Signals BFI Film Academy, Jordan Feemster is now a trainee with Lucasfilm on the set of the upcoming Han Solo movie, a spin off from the Star Wars franchise. The Han Solo story takes place in the time period between Revenge of the Sith and the first Star Wars (now known as A New Hope), obviously Jordan is under incredibly strict non-disclosure agreements so can’t share any on-set trivia. However, with applications now open for the 2018 BFI Film Academy, we invited Jordan to write about out what the course did for him and his new life on set with BB-8 and crew. In 2015 I was accepted on the Signals BFI Film Academy and here I learnt the basics of filmmaking and etiquette that are essential to working on a film set. Importantly, they introduced me to the world of sound recording and that was the start of a journey that led me to where I am now. As a huge fan of the Star Wars franchise myself, I don’t think much will ever be able to top walking into work in the morning and seeing the amazing sets that we get to shoot on, whether it be in a studio stage or on location in a different country. The opportunity to be on set for the biggest movie franchise of all time is enough in itself, let alone actually being part of the main unit shooting crew on one of its films. After graduating from BFI Film Academy I was accepted onto an intensive course at National Film and Television School which then led to me applying for the BFI Lucasfilm Opportunity Programme, and well here I am. As my first professional gig, I couldn’t have had much of a better starting point than at the top of the industry. I have been lucky enough to work along side some of the best crew from all over the world and in doing so I have learn’t from the best; furthermore helping me progress and improve all the time. The level of skill I am surrounded by is constant motivation for me to better myself as much as I can. The film industry is well known for its tough, hard working environment, and is no doubt very tiring. BUT, I wouldn’t change what I do for the world, I genuinely look forward to work every day and appreciate everything I do. Including (but not limited to), providing renowned directors/producers with a sound feed from the mixer, or being able to capture sound by swinging a boom over world famous actors. It is now coming up to nearly two years since I started the course at Signals and I cannot believe the speed at which I have progressed. I thank everyone involved for instilling in me the right ethics towards film and for providing me with the opportunities I have received. Without Signals/BFI and the doors it opened for me I would not be lucky enough to proudly say that “I work on Star Wars”. Are you 16-19? Passionate about film? Apply for BFI Film Academy now! A huge thank you to Jordan for taking the time to write about his incredible experience, we look forward to following his career as it goes from strength to strength! Are you 16-19? Passionate about film? Want a career in the film industry? Applications are now open for our 2018 BFI Film Academy. Click here to find out more.